The Streamlight MicroStream LED Pen Flashlight features a super bright LED with 30,000 hour lifetime for long lasting performance. At 3.5" long it will easily tuck in a purse, wallet or backpack so you can keep it nearby at all times. The corrosion and waterproof construction with an unbreakable polycarbonate lens will take all the punishment you can dish out. Proprietary Micro Optical System (MOS), for optimized output and runtime; up to 20 lumens output for up to 1.5 hrs. An internal polymer body liner and shock proof switch housing allow for operation under the most extreme conditions. The MicroStream is a compact single AAA alkaline battery powered LED flashlight designed for use in all markets. It features a push button tail cap switch, momentary or constant on operation, a combination pocket/hat clip for convenience, and amazing brightness and run time for a light of its size and price. The aluminum housing with Type II Military Spec anodizing helps make the light extremely durable and abrasion resistant. Utilizing the latest C4 LED technology, this ultra compact and lightweight flashlight is optimized for output and run time. 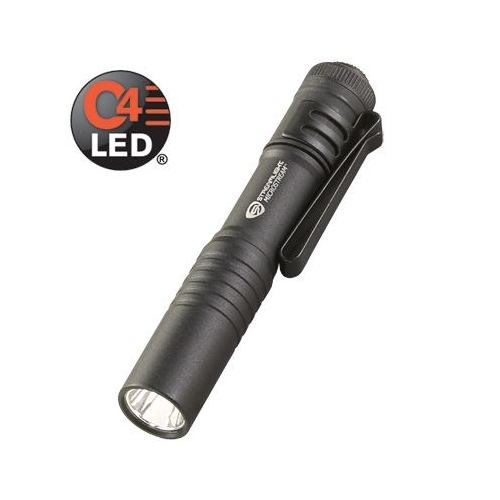 Featuring C4 LED technology for extreme brightness and shockproof with a 30,000 hour lifetime, the MicroStream LED pen light provides up to 683 candela peak beam intensity, 28 lumens, and a beam distance of 52 meters. Powered by one AAA alkaline battery (included in purchase), the MicroStream LED pen light has a run time of 2.25 hours. Built for durability, the MicroStream LED pen light features a corrosion resistant machined aluminum alloy case with a Type II MIL-Spec black anodized finish. Its unbreakable and scratch resistant polycarbonate lens is O-ring sealed. Rated IPX4 for water resistant operation, the MicroStream is also 1-meter impact resistance tested. Weighing 1.04 ounces with the battery (included in purchase), the MicroStream LED pen light measures 3.5 inches in length with a body diameter of 0.60 inches.